An infectious waste generator is any individual, firm, facility or company that produces infectious waste. Large infectious waste generators must register with the Ohio EPA. Commercial infectious waste treatment facilities must obtain a permit from the Ohio EPA. Transportation of infectious waste is regulated by the Public Utilities Commission of Ohio (PUCO). What is an infectious agent and waste? A type of microorganism, pathogen, virus, or proteinaceous infectious particle that can cause or significantly contribute to disease in or death of human beings. Any other waste materials generated in the diagnosis, treatment, or immunization of human beings or animals, in research pertaining thereto, or in the production of testing of biologicals, that the public health council created in section 3701.33 of the Revised Code, by rules adopted in accordance with Chapter 119. of the Revised Code, identifies as infectious wastes after determining that the wastes present a substantial threat to human health when improperly managed because they are contaminated with, or are likely to be contaminated with, infectious agents. 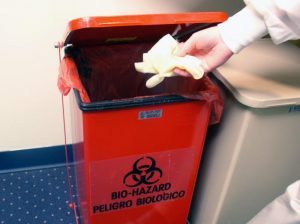 As used in this rule, “blood products” does not include patient care waste such as bandages or disposable gowns that are lightly soiled with blood or other body fluids unless those wastes are soiled to the extent that the generator of the wastes determines that they should be managed as infectious wastes. Autoclaves – Steam autoclave treatment combines moisture, heat and pressure to inactivate microorganisms. Autoclaves must operate at a minimum of 121º Celsius for 60 minutes, at 15 psi during the treatment cycle to properly treat waste. Chemical Treatment – Treats materials (mostly cultures of infectious agents) by disinfecting harmful microorganisms with 15 percent sodium hypochlorite solution (bleach), at a minimum contact time of 20 minutes.